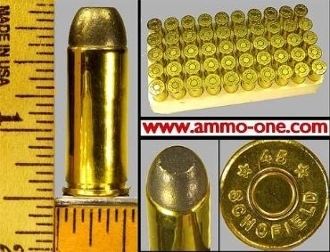 History of the 45 Smith & Wesson Schofield Cartridge: The 45 Smith & Wesson Schofield, a.k.a. .45 Schofield, a.k.a. .45 S&W was introduced in 1875 to be used in the Smith & Wesson Schofield Revolver, which was adopted by the U.S. Army until 1892, when it was replace by the 45 Colt revolver & cartridge. Commercially loaded until 1940, it is now only produced by a few secondary makers, and is conceded an obsolete cartridge by the major manufactures.